The PhD Program in Business Administration with an emphasis in Supply Chain Management prepares students for careers in research and teaching in supply chain management. Students in the program gain knowledge in the theoretical and substantive areas of supply chain management. They acquire the conceptual skills and methodological tools necessary to design and conduct independent research and interact with others in academic and business environments. Throughout the program, the faculty works closely with doctoral students, training and mentoring them to become great scholars, educators, and colleagues. The purpose of the PhD program in Business Administration with a Concentration in Supply Chain Management is to prepare individuals for academic careers in research, teaching, and service at universities. Students seeking admission into the doctoral program should have the interest and commitment to pursue the knowledge and skills necessary for academic careers at leading universities and institutions. View Info and Requirements / F.A.Q. Using diverse research traditions including empirical (e.g., survey, secondary data) and mathematical modeling, the Supply Chain Management faculty are actively involved in research in diverse areas such as retailing, forecasting, inventory management, logistics outsourcing, and transportation management. The faculty work closely with doctoral students, training and mentoring them to become scholars and educators. The normal program size is eight on-campus, full-time doctoral students, allowing for close interaction with the faculty and other students at various stages in the program. A tradition of scholarship and excellence in teaching and learning. Applicants who wish to apply for the doctoral program with an emphasis in Supply Chain Management must submit their applications to the Graduate School of Business by December 15th. Learn more about admissions requirements. We welcome candidates who are strongly committed to being part of a full-time PhD program and show motivation and commitment towards meeting the requirements for our degree. We take a holistic approach in assessing candidates by taking into account their past scholastic record, letters of recommendation, test scores, prior work experience, and a statement of purpose. Prior research or teaching experience is desirable but not required. We especially encourage students to establish early contact with the PhD Program Coordinator, Dr. John Aloysius (jaloysius@walton.uark.edu), who will then work with potential applicants to assess their likely fit and work with them through their application process. The PhD Program in Business Administration with a Supply Chain Management Concentration prepares individuals for research, teaching, service, and collegial roles in Supply Chain Management/Logistics/Transportation departments. Course work for the PhD Program in Business Administration with a Supply Chain Management Concentration is typically completed during the first two and a half years of the four-year program. Students take a total of 14 courses and normally enroll in three courses per semester. The course work comprises of five SCM core PhD seminars, three seminars in a supporting field, and five methods classes. 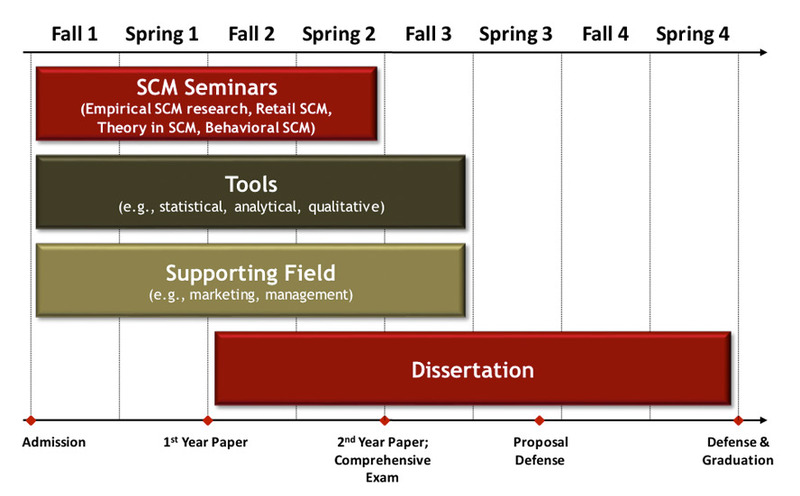 Each doctoral will take five SCM Core PhD seminars. This course introduces students to the key substantive areas of logistics and supply chain management through a combination of lectures covering topics such as inventory control and forecasting and seminars discussing associated academic literature. In this seminar, students will review and discuss a broad cross-section of research articles in the realm of supply chain management. During the discussions particular emphasis will be placed on the interest and merit of the research question(s), the appropriateness of the theoretical framework and/or hypothesis development, the adequacy of the research design, incl. data collection, measurement, and analysis (methodology), the accuracy of the discussion of the results. Each week’s readings will follow a common theme (content area and/or methodology), such that students will be familiarized with a wide range of relevant SCM literature and (mostly empirical) methodologies. In this seminar, students will be exposed to key theories from fields such as strategic management and marketing and will learn about how these theories have been or can be applied to supply chain management research. Each week’s readings comprise about 3-4 conceptual and empirical research articles. During the discussion particular emphasis will be placed on the main premises of each theory, comparing and contrasting the inter-relationships among these theories, identifying applications of such theories to supply chain management research questions, and the critique of the use of theory in the context of the hypothesis development. The focus of this seminar is human behavior as it pertains to creating value in the supply chain and beyond. Topics may include but will not be restricted to behavior in inventory and ordering processes, in retail replenishment, in global supply chain management, in the face of adversity and catastrophic supply chain risk, and in supply chain relationships. The focus of this seminar is research in retail supply chain management. As retailers have become more powerful members of their supply chains, retail-specific supply chain management research has become more prevalent in the literature. Seminar topics may include but will not be restricted to retail sales and order forecasting, inventory management, and store execution issues. The department offers each seminar every other year, such that students will take these seminars in the spring and fall semesters of their first and second years in the program, respectively. These seminars are designed to teach students a range of theories, concepts and research capabilities relevant to the domain of SCM. Courses for the supporting fields requirement are selected in consultation with the student's PhD Program Advisory Committee. All courses taken for the supporting fields requirement must be at the graduate level and/or taken for graduate credit. A minimum of six hours should be taken in graduate research seminars. The departmental PhD program coordinator will work with each doctoral student to define a set of courses that meets the requirements outlined above as well as the student's needs and interests. To that end, each student should meet with the departmental PhD program coordinator before June 30 for registration for the fall semester, and before November 30 for registration for the spring semester (a hold will be placed on each doctoral student's account and will only be lifted after this meeting). Students are expected to complete publishable research articles by the end of their first and second years, respectively. First-year papers may be co-authored with other doctoral students, but the student is expected to significantly contribute during all stages of the research process. Second-year papers should be completed by each doctoral student individually (under guidance and supervision of a faculty member). Failure to satisfactorily complete the first and second year paper requirements may result in the student's termination from the PhD program. Each doctoral student is subject to an annual review to assess the student's progress and performance in the program and to discuss the student's plans for the subsequent academic year. All review forms must be submitted to the Graduate School by June 30 of each year. Hence, it is suggested that the student meet with the departmental PhD program coordinator by June 15 of each year. The departmental PhD program coordinator may also seek input from the student's adviser in completing the student's annual review. Following completion of SCM core coursework, students take written and oral comprehensive exams at the end of their second year in the program. The comprehensive exam is a closed book, closed notes exam and is taken in a timed and controlled environment. The exam consists of a set of questions developed by the SCM faculty. These questions are designed to offer the student an opportunity to display his or her knowledge of the literature, theories, concepts and tools in the domain of SCM. Particular emphasis is placed on the application of these elements to investigate a given research question. The comprehensive exam may also contain questions that are geared toward a student's particular dissertation research interests. The oral comprehensive exam is given several weeks after the written comprehensive exam. Typically, the student will be given an opportunity to elaborate on or clarify any of his or her answers from the written comprehensive exam. In addition, the examining committee may choose to discuss any other relevant topic, including but not limited to the student's research. Students who receive a passing grade on the comprehensive exams advance to candidacy. Students who receive a failing grade on the comprehensive exam may, with approval of the student's examining committee, retake the exam once. Failure to pass the exam after two attempts will result in the student's termination from the doctoral program. A dissertation will be written under the guidance of Supply Chain Management faculty who will chair the student's dissertation committee. In addition to the chair, the dissertation committee will include a minimum of two additional graduate faculty members. One graduate faculty member outside the Supply Chain Management Department may be chosen for this committee depending on the dissertation topic. Near the end of the third year in the program, students must successfully defend their dissertation proposal. Each student is required to share a written dissertation proposal no later than two weeks prior to the scheduled dissertation proposal defense. The scope of this proposal will be defined by the student's adviser and will typically include a draft of key sections, including the introduction, literature review, theory/hypothesis development and methodology sections. In the case of a multi-essay dissertation, the proposal should, at a minimum, include a detailed draft of the first essay and an outline of the other essays. The dissertation proposal defense most often consists of two parts. First, the student will give a presentation outlining his or her dissertation. This presentation is followed by Q&A and/or a discussion of the student's dissertation research. Hence, the purpose of the dissertation proposal is twofold: a) the examining committee assesses the student's research capabilities (i.e., the ability to conduct meaningful and rigorous research and to defend his or her work), and b) the examining committee will work with the student to identify potential weaknesses and areas that may need improvement. The dissertation committee will determine whether the student satisfactorily defended his or her dissertation proposal. Failure to do so may result in a second proposal defense being scheduled at a later date or in the termination of the student from the PhD program. This decision will rest with the student's dissertation committee. The successful completion and defense of a dissertation are an integral requirement of the PhD program. During the dissertation defense, the committee members will verify that all their concerns/criticisms have been adequately addressed. The student may be asked to provide further explanation/justification on a select number of issues. In addition, the student may be asked to make some further revisions prior to submitting your final dissertation to the Graduate School. Failure to satisfactorily defend the dissertation will result in the student's termination from the PhD program. As future faculty members, doctoral students not only acquire critical research skills, but also gain teaching experience. Each student will typically teach two undergraduate classes per academic year, starting in the second year of the program. These teaching assignments are a part of the students' graduate assistantships. In their first year in the PhD program, doctoral students will attend a semester-long seminar series offered by the Walton College's Center for Teaching Effectiveness. The goal of these seminars is to give future instructors practical advice on a broad variety of teaching-related issues. The Center also offers mentoring and coaching services to first-time student teachers. Students in the program are supported financially with tuition waivers and nationally competitive stipends (i.e., graduate assistantships) for four full years (up to $39,800 per year for outstanding candidates), assuming satisfactory progress in the program. The department, college, and university also provide a broad range of support for doctoral student research. For example, doctoral students are funded to attend major domestic and international conferences to present research papers. Faculty are integrally involved with doctoral students on research targeted for publication in major journals. Recent articles coauthored by Supply Chain Management faculty and doctoral students have appeared in the Journal of Business Logistics, Journal of Retailing, Journal of the Academy of Marketing Science, Transportation Journal, and other top-tier academic journals. How many PhD students are in the department of Supply Chain Management? The Supply Chain Management department typically has eight to ten PhD students, at differing stages of their program, at any one time. In what areas do PhD Supply Chain Management students specialize? Our PhD students specialize in a broad range of topics including but not limited to retail SCM, sustainability in SCM, logistics outsourcing, transportation management. Inventory management, and forecasting, for example. The Supply Chain Management department may accept late applications but only on a space-available basis. However, please note that late applicants may not be eligible for fellowship funding. Do I need a master’s degree to be admitted to the PhD Program? While a master’s degree is not technically required, most successful applicants to the PhD program in Supply Chain Management have a master’s degree. Your application may be more competitive with a master’s degree and the Department, therefore, recommends that applicants obtain their master’s degree prior to applying for the PhD program. Will you accept the GRE? While the Department of Supply Chain Management program prefers the GMAT, applicants with GRE scores will be considered as well. What is a competitive GMAT score? Successful candidates typically have GMAT scores in the 680-730 range. Candidates who have GMAT scores below 650 points are encouraged to re-take the test prior to the application deadline of December 15th. Can I participate in this PhD program part-time or distance ed? No. This PhD program is full-time and requires a minimum of four years to complete. Most students are on assistantship and are required to work 20 hours a week. Between your coursework, teaching, and research, this program is a full-time commitment.